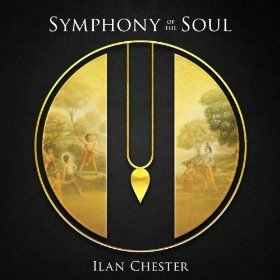 I had the honor of singing some backup vocals on the fabulous Ilan Chester's new CD "Symphony of the Soul." This CD is a collection of beautiful, powerful mantras composed with symphonic music. Ilan, who was born in Israel and raised in Venezuala, has the most transcendent, commanding voice. Check out "our" song Gauranga. But mostly, I am thrilled to realize that there was a point in my life when I wasn't shy about singing in front of others. It's so nice to be back into that place of non-shyness again. Joy to the world indeed! 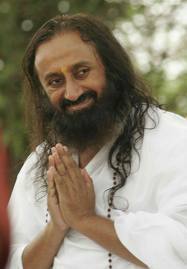 Here's some terrific wisdom from Sri Sri Ravi Shankar about the benefits of Sanskrit mantra. "Different letters affect different parts of the body. Our body is like a garland of letters, it is called akshara maalika (garland of letters). You are a mala or rosary yourself; different letters affect different centers. Sanskrit, the oldest of languages, is organized in such a way that it fits Darwin’s theory of Evolution. The first letter of Sanskrit language is A, which is what every child says. The last of the vowels is Aha. What is the sound that comes when you laugh? Aha ha ha! So, in laughter, the entire language is present, from A to Aha. In Sanskrit, Aha is used for wonder and for laughter. You cannot laugh without Aa and Ha in it, even if you try. If you observe the Sanskrit vowels, which are A, Aa, E, Eee, Oo, Oou; observe how the sound is generated. The soundA comes at the root of the throat, Aa comes more outward. E comes from the palate, and Eee is more outward. Oo comes to the lips, and Ruu, the tongue rolls. The rest of the letters are I, Ai, O, Au, An, Am, Aha. If you move to consonants, they start with Ka, Kha, Ga, Gha, Na and they start from the throat. Then Ca, Cha, Ja, Jha, Nna, the sound move towards the mouth. Then come Ta, Tha, Da, Dha, Na, these come with the help of the dental movement. The last few come from the lips Pa, Pha, Ba, Bha, Ma. If you observe, all these sounds move from the base of the throat outwards. Even the animal kingdom is taken into consideration here. All birds emit the Ka and Ca sound. Only two birds, i.e., parrot and mynah can use the sound Ma also. All other birds only use Ka and Ca. Amphibians like frogs, make sounds that sound like Ta, Tha or Tra. Mammals like cows, sheep, goats, horses, etc., use Pa, Pha, Ba, Bha, Ma, or the next set of consonants. Lastly come all the other alphabets like Ya, Ra, La, Va, She, Sha. Therefore, the alphabets and sounds are arranged in the same order as the theory of evolution, i.e., birds, animals, mammals and humans. Isn’t that interesting? It is absolutely fascinating. There was some research done in England; scientists found that Sanskrit language is very suitable for neurolinguistic functions. For about ten years, scientists were trying to understand why people with a base in Sanskrit are very sharp at mathematics and calculations. Do you know about 60% of the English language follows Sanskrit? If you see the roots of the English words, most of them are Sanskrit based. Svasa is sister, Brata is brother, Pitha is father and Mata is Mother. If you draw parallels like these, you will realize that the base of English is Sanskrit language." How Cool Is It When an Old Friend releases a Hot New Movie? Several years ago I hosted a dashing young filmmaker named James Ponsoldt﻿, who stayed at my house in Woodstock during the "Woodstock Film Festival." This is one of the many, many cool things about living in Woodstock, NY. We treat everyone who visits like family--whether it's Gabriel Byrne, David Byrne, or just some visiting parks official from the DEP. I had the honor of spending a few days with director James Ponsolt and producer Scott Macauley while they stayed at my house in 2006. Yes, I'm name dropping. But why not? I'm proud of them and am always happy to promote my fellow artists. It was clear to me and the festival judges that these two men were not only immensely talented, but also caring and kind. My dog Chloe, by the way, adored them too. Anyway, it's been thrilling to watch Jame's rapidly rising career in Hollywood. 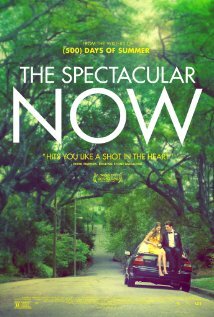 It was even more of a thrill to read the spectacular review in The New Yorker of his latest movie, "The Spectacular Now." Critic David Denby loved the film and called James "someone to watch." I'm so proud of you, James! I encourage everyone to see this tender, beautiful movie! It was very disturbing to find the Dog Who Can Open Doors waiting outside for me when I returned home from the library this morning. My previous dog Wallace (of "Rex and the City" fame) probably would have chased the car all the way to the library. Chloe, fortunately, was curled up on the front lawn, waiting. I'm also fortunate that we have a huge lawn far from the road. We don't lock our doors in the country, but I guess it's time to do so! Her English Setter friend Rainbow, by the way, was the one who first taught her to open doors. The 17th Karmapa has a new blog! I don't think I'll ever stop marveling at the wonders of the internet. 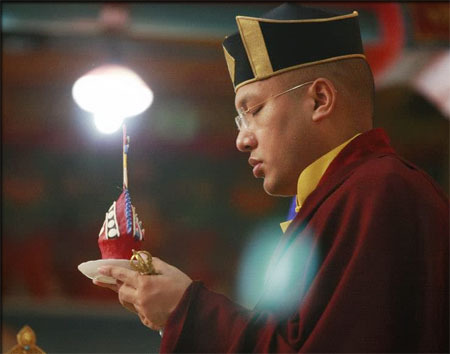 Just think about it: at any time of day we can read the blog of, say, the Karmapa (!) and receive amazing enlightened teachings. We really have no excuse anymore not to become realized.....the teachings are literally in the airwaves! Here's an interesting blog about the origins of the Karmapa Chenno mantra. I encourage you to read and subscribe to Eileen O'Hare's blog. Eileen is a shaman, a teacher, a healer and--in my mind--an embodiment of the Divine Feminine. Soon she'll be releasing her first sacred chant CD. I've heard it's magnificent! I had a wonderful recording session in the studio yesterday. We’re arranging the backup vocals for my gospel choir. I can’t wait to hear them sing the chorus to Govinda Hare, a song I am recording in honor of my friend Shyamdas, who left his body in January. Today’s goal is to NOT let my critical mind step in and judge everything I created. My inner critic can be so harsh and ruthless. It scares me sometimes.